The F-Factor diet is designed by Tanya Zuckerbrot, a dietitian, with 10 years of practical experience helping people to lose weight. The creator of the diet claims that not only will the diet promote weight loss but it will also improve the appearance of skin and hair, boost energy levels, as well as reducing the risk of cardiovascular disease, diabetes, colon and breast cancer. General diet guidelines are similar to the ‘Zone Diet’. Tanya recently released an updated version of F-Factor called The Miracle Carb Diet. 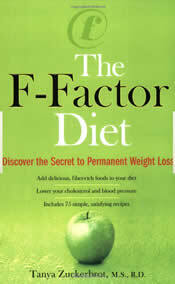 The F-factor diet is based around increasing the intake of high fiber foods. Fiber helps to promote the feeling of fullness and to reduce appetite. Fiber also controls blood sugar balance which helps to maintain high energy levels. Meal plans are set at approximately 1100 calories per day. The book includes 75 recipes as well as guidelines for making suitable food choices when eating out. Other low Calorie meal ideas can be found here. The F-Factor Retails for $24.95 USD. The diet emphasizes adding healthy foods to the diet rather than eliminating foods. Contains a good balance of protein, carbohydrates and fats and does not eliminate entire food groups. High nutrient content due to the emphasis on fruits, vegetables and unprocessed foods. Good for those who feel hungry when dieting because the high fiber content reduces appetite while still allowing for a reduction in calories. Beneficial for those with a high risk of diabetes and cardiovascular disease. Serving sizes of outlined meal plans are very small. Calorie content may need to be increased for those with higher calorie requirements. The first two weeks of the diet requires a specific brand of crackers with no allowance made for suitable alternatives. Diet will need to be adjusted for those who are allergic or intolerant to wheat as fiber one and fiber crackers are listed as a requirement of this diet. Inadequate guidance for monitoring fat intake and the types of fats in the diet. Overall this is a sound eating plan based on solid nutritional principles however the calorie content will need to be increased if the diet is to be continued for more than a few weeks. Those who have a physically active lifestyle will also need to increase the calorie and carbohydrate content of the diet in order to support higher activity levels. This is a diet that can be continued as a healthy eating plan at a higher calorie level and is especially suitable for those with a high risk of cardiovascular disease and diabetes. Another version of the Weight Watcher eating plan that has been around for years and years so it is probably good and definitely great for diabetics. It’s common sense to eat fruits, vegetables, whole grains, etc. etc. but if you need a definite plan this would probably work. I have Crohn’s disease and pancreatidis. Can you let me know if I can go on this diet? glen, other than the book…where do you get recipe suggestions for the f factor way of eating?? I have done this diet and have lost 20 pounds in three months. It’s easy and unlike other diets, you don’t have feelings of hunger and deprivation.